At least 16 people have died in floods caused by three days of monsoon rains in the eastern Indian city of Calcutta. The city has received almost 20% of the total annual rains that it usually gets during the monsoon months in three days alone. Most of the city's roads are under water as are tram and railway tracks. Storms have affected large parts of South Asia over the past week, with at least 140 people killed week elsewhere in India. The Calcutta weather office said the city has received more than 300mm of rain since late on Monday night. "Calcutta gets between 1600 to 1700mm of rain every monsoon and now we have got so much rain in just three days." The weather office predicted more rain until today. Wreaking havoc for two days, water had started subsiding in many places but not the threat of a replay. The monster that was 300 km off Calcutta on Tuesday night ripened into a fullblown depression and halved the distance over 24 hours. If the depression retains its force and covers the remaining 150 km without changing course, the city and other south Bengal districts ran the risk of being pounded by heavy rain for two days more. Weather officials monitoring the depression with trepidation noticed in the morning that it had started inching towards the Bangladesh coast. However, the phenomenon suddenly changed course and advanced towards Bengal. The depression can change direction again or it can run out of steam. If it doesn’t and manages to creep up on Bengal, heavy rain is the most likely fallout. PAKISTAN - The chief minister of Balochistan Province said the scale of the disaster following recent rains and floods was "no less" than that caused by the northern Pakistan earthquake of October 2005, at least in terms of damage to livestock and land. Loss of life is now being put officially at 150, but there are fears many thousands still missing are in fact dead, swept away by raging rivers. "A large number of people are still unaccounted for...Food is getting through; army medical teams have inoculated people and treated the injured - but we have no idea how we will manage without our livestock." 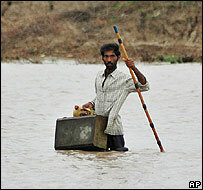 In many villages, where access is still arduous, the humanitarian situation is said to be grim. "No one is helping these people. Some have reached towns like Jhal Magsi to get food, thousands of others are displaced." Raging river torrents are still wreaking havoc across the Nasirabad and Jaffarabad districts in the centre-west and southeast of Balochistan along its border with Sindh Province. According to reports from eastern parts of Balochistan bordering Sindh, people whose villages have been flooded by breaches in canals have been camping out along roads or on hills for days. While food supplies have reportedly been delivered, many are without shelter and additional rain over the past few days has worsened their plight. Inclement weather in coastal areas of Sindh, including the town of Thatta about 100km east of Karachi, has meanwhile continued to add to the misery of people. Major road links between Quetta and Karachi, and along coastal areas remain cut off and damage to infrastructure means large parts of Balochistan are without gas and some without power. Villages have been inundated by water, and some remain accessible only by helicopter.